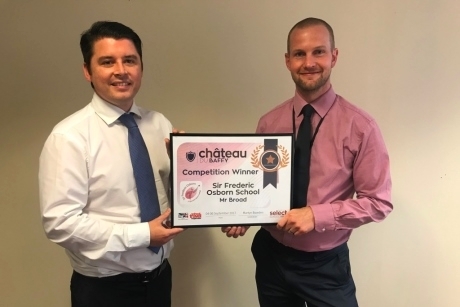 A school in Welwyn in Hertfordshire has been revealed as the winner of a free residential trip to Chateau du Baffy, Normandy, run by Select School Travel. Earlier this year, Select School Travel offered schools in the UK an opportunity to win a free trip for 30 students and four teachers in September to Chateau du Baffy in Normandy, France. The winner of the competition has been confirmed as Sir Frederic Osborn School of Welwyn in Hertfordshire. The competition entry was submitted by Head of Humanities, Mr Broad. The competition was judged by Elaine Skates, CEO of the Council for Learning Outside the Classroom and Rob Yandell, publisher of School Travel Organiser magazine. According to the judges, the school’s entry clearly demonstrated that the trip opportunity would enable pupils who had never been on a residential school trip before to participate and allow them the chance to integrate socially outside of a classroom environment, plus affording opportunities to raise self-esteem and aspirations. Inclusivity is a factor which Elaine Skates of CLOtC emphasises as having a “vital need” when providing residentials. The competition was launched by Select with the intention of providing an opportunity for students who may never have been on a residential school trip before, in order that they could experience the benefits of such an experience. Select School Travel also believes in the initiative of the Learning Away campaign for ‘brilliant residentials’, which asks schools, providers, and other related parties to pledge to work with others and provide more life changing #BrilliantResidentials for young people. The campaign encourages a number of considerations such as: recognition in the ways in which residential learning can impact on curriculum; promotion of the clear links between the impact of residentials on resilience and confidence; and recognition of the opportunities that residential experiences provide to support promotion of children and young people’s emotional health and wellbeing. For more information, visit www.selectschooltravel.com.